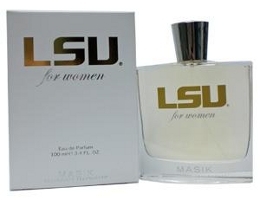 LSU For Women (shown): "A signature scent inspired by the majestic spirit of the Fighting Tigers. LSU for Women opens with Juicy Plum and Golden Bourbon, symbolizing the time honored school colors of Purple and Gold, pumped up with a splash of Sparkling Mandarin. Dewey Evening Jasmine, Egyptian Tuberose and Turkish Rose Petals dance throughout the heart inviting you to boost and invigorate your school spirit while Warm Honey, Black Agar, Deep Patchouli and Soft Oak lend strength to the base creating a fragrance that is as fierce and confident as the Tigers themselves." LSU For Men: "A signature scent for the LSU man - Let yourself unwind and enjoy the lush serenity of the Louisiana State University campus. As the breeze gently blows throughout the oak trees, feel the fresh splash of Frozen Basil, Calabrian Bergamot and Armoise. Transcend your spirit as Provencal Lavender, Crushed Sage, Violet Leaf and Clove Bud Madagascar blend for a cool, purple sensory experience. Take a deep breath and relax while Incense, Indonesian Vetiver, Patchouli and Oakmoss encourage you to soak in the warmth of the amber sun." Actually these fragrances don’t sound bad….but the idea of thousands of students wearing them all at once….there’ll be a cloud over the university. LOL…yeah, I suppose if you didn’t like the scent, it would be a darned shame to have to smell it all over campus. I ended up trying the UNC line in this brand (I work on campus) and then going swimming for an hour afterwards. Even after my shower, I could still smell both the Men’s and Women’s versions on my respective arms. It was a bit nauseating. Neither of them were that bad to begin with, generic and artificial but not offensive, but those base notes- phew! Buyer beware- these things have got some lasting power. “…feel the fresh splash of Frozen Basil…” Ouch! lol Actually these do sound intriguing, especially the women’s, but heeding Katich’s warning, I’m wondering how I might sample these. No idea…I think they’re sold only through Masik & the college.